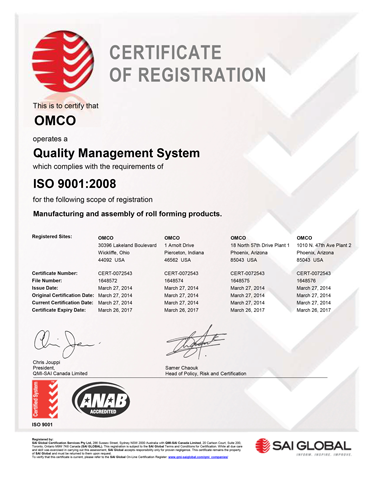 OMCO Roll Forming is proud to announce that its management system has been certified to ISO 9001. OMCO’s ISO 9001 certification applies to all of its operating locations. This includes its headquarters in Wickliffe, Ohio as well as its manufacturing facilities in Pierceton, Indiana and Phoenix, Arizona, which is home of the company’s OMCO Solar division. ISO 9001 requires that a company’s quality management system establishes a clearly defined set of procedures, guidelines, policies and practices which will ensure that the organization provides products that consistently meet customer requirements. Included within the quality management system is a company-wide commitment to continuously improve its processes with the goal of greater customer satisfaction.